Project plans are maps that chart the course of your projects. 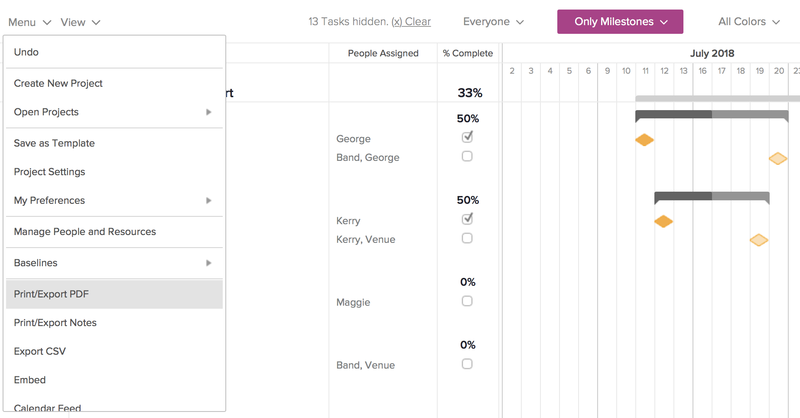 As you build a plan, you’ll begin to map out the tasks, dependencies, task owners, and more. But don’t forget a very important component of any project plan: milestones. A milestone is a marker in a project that signifies a change or stage in development. Milestones are powerful components in project management because they show key events and map forward movement in your project plan. Milestones act as signposts through the course of your project, helping ensure you stay on track. Without project milestone tracking, you’re just monitoring tasks and not necessarily following the right path in your project. Milestones can do more than just show progress—they can help you communicate what’s happening with your project. TeamGantt features project milestones in its free project management software, so it seamlessly syncs with all of your gantt chart's moving parts. So what’s the difference between a task and a milestone? Let’s take a closer look. Is it a task or a milestone? You’re not building a rocket here—you’re building a project plan, and the components aren’t that complex. That said, distinguishing between tasks and milestones can be difficult on larger projects, or if the project you’re managing just isn’t within the realm of your expertise (yet). Is this a task or a deliverable? Will this impact the final deadline? Is this an important moment in the project that will indicate forward progress? Does this need to be reviewed by stakeholders? Is this an event that impacts the project? Essentially, you want to make the most important events of your project milestones so they can be easily seen and mapped by the project team. Milestones are given additional significance over tasks in a plan so the project manager can track the tasks while the team and stakeholders focus on forward progress. Let’s dig a little deeper and explore 3 specific examples of how using project milestones can benefit your projects. No plan is ever complete without a list of deadlines! The best way to make them noticeable is to use the project management milestones and deliverables technique. What does this mean? Make the deliverables project milestones! Why do this? Well, it’s no secret that not everyone wants to pore over your beautiful project plan to find key dates. Most people—your teammates included—want a top-level view of key dates and events. Milestones are great for this purpose because they’re called out in a special way—usually with a diamond—in project plans. While you should list the tasks and effort leading up to a project milestone, be sure to present the milestone at the end of those tasks to signify a delivery, or even a presentation of, the deliverable. Here’s an example of a project milestone that’s been used to mark the publishing deadline for a blog post. Are there days from now until the end of your project that could impact your project in some way? Maybe your team will need to be out of the office for a mandatory training. Maybe there’s a board meeting you’re expected to attend. It’s important to keep all of these important events in mind when you’re planning a project because they could possibly impact your project schedule. So why not include them as project milestones so you can track them all in one place? In this example, the team’s off-site strat-op meeting has been added to the project plan as a milestone so work can be scheduled around it. Many projects rely on the work produced by external teams or partners to make forward progress. If you’re not tracking those external factors somewhere, there’s a great chance you’ll forget to follow-up on it. That’s why it’s important to list these deliverables as project milestones if you’re working on a project that depends on someone or something outside of your project. Here’s an example of what that might look like for a client approval. Creating milestones for your project plan can be simple, especially with TeamGantt. Once you’ve mapped out your overall process and plan with your team, you can easily add tasks, identify gantt chart milestones, and determine task owners. Adding a milestone (or converting a task to a milestone) is very easy in TeamGantt. Project milestones are easy to create and even easier to track because you’ve called out the most important points in your project. Want to give clients and stakeholders a high-level view of the project? Simply follow these steps to share a PDF of key project milestones in your gantt chart. 1. Filter your project by milestones. From your gantt chart view, click the All Dates menu at the top of your gantt chart, and select Only Milestones from the drop-down. 2. Export your filtered project to a PDF file. Navigate to your project's Menu, and select Print/Export PDF from the drop-down. Customize your PDF settings, then click View PDF to complete the export. From there, you can download and/or print your PDF to share with clients and stakeholders. Who would have thought such a critical step could be so easy? TeamGantt makes it easy to create, track, and collaborate on all your project milestones so nothing slips through the cracks. 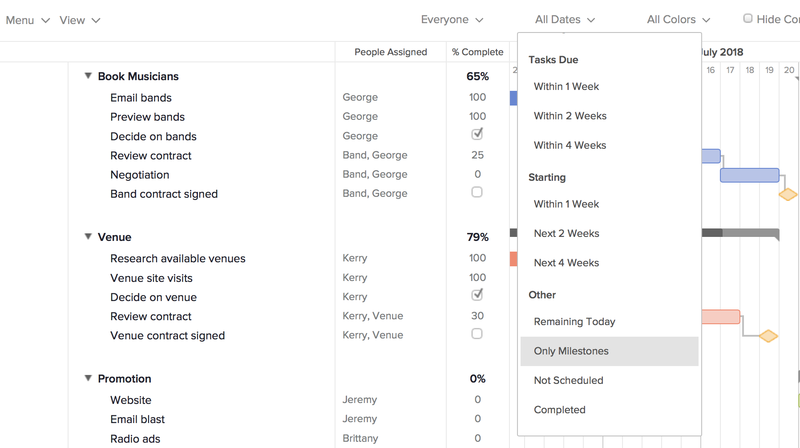 You’ll have all the features you need to ensure projects finish on time and under budget—from drag and drop simplicity and team collaboration to customizable views and workload management.